Please note that all skaters and goalies must present government issued photo ID before every playoff game in order to be eligible to play. The timekeeper will be checking every player on every team before every playoff game. Reasons such as, however not limited to: forgot to bring government issued photo identification, didn't drive to the game, left government issued photo identification at home or in the car or in the dressing room, will not be accepted. All skaters must have a minimum of 5 GP and all goalies must have a minimum of 3 GP. There are no skater exemptions for any reason for all teams including your own team and your opponents. Please check the full playoff rules below at the bottom of this page for full details. The higher seed is always the home team. Only skaters who played in at least a minimum total of five (5) or more of his or her team's regular season games and goalies who have played in at least a minimum total of three (3) or more of his or her team's regular season games are permitted to play in the playoffs. Skaters who did not play in at least a minimum total of five (5) or more of his or her team's regular season games and goalies who did not play in at least a minimum total of three (3) or more of his or her team's regular season games are not permitted to play in the playoffs (please see below under Goalie Unavailability section rules for possible application and permission for emergency goalies). All players, skaters and goalies, are required to bring government issued photo identification to every playoff game in order to confirm if a player is eligible or not. If a player is unable to present his or her government issued photo identification when requested by an on or off ice official for government issued photo identification, then that player will no longer be permitted to participate in that playoff game. If the player refuses to comply, even with a warning, and continues to play without presenting his or her government issued photo identification, then unless that player stops playing, that player's team will automatically default and their opponent will be awarded the victory. Reasons such as, however not limited to: forgot to bring government issued photo identification, did not drive to the game, left government issued photo identification at home or in the car or in the dressing room, will not be accepted. However, a player may appeal to the on or off ice officials and if at least one of the on or off ice officials knows or recognizes the player, who does not have government issued photo identification, as a regular skater who has played in at least a minimum total of five (5) or a goalie who has played in at least a minimum total of three (3) or more of his or her team's regular season games then that player will be permitted to play. If none of the on or off ice officials know or recognize the player, who does not have government issued photo identification, as a regular skater who has played in at least a minimum total of five (5) or a goalie who has played in at least a minimum total of three (3) or more of his or her team's regular season games, then that player's appeal will be rejected and that player will not be permitted to participate in that playoff game. If that player refuses to comply, even with a warning, and continues to play, then unless that player stops playing, that player's team will automatically default and their opponent will be awarded the victory. In the event that a team does not have any of their eligible goalies who have played in at least a minimum of three (3) or more of his or her team's regular season games available to play in a specific playoff game(s), the team may apply for permission from the CAHL - Calgary Adult Hockey League for an emergency goalie(s) to play in that specific playoff game(s). 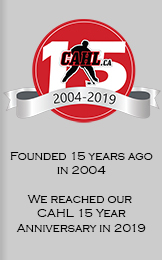 Each case and application will be reviewed and permission may or may not be granted for any reason with or without explanation, at the CAHL - Calgary Adult Hockey League's sole discretion, for any emergency goalie(s) or specific playoff game(s). Emergency goalies are still required to bring government issued photo identification to every playoff game in order to confirm if the goalie is eligible or not as per our Government Issued Photo Identification Requirement section rules above. Emergency goalie permission must be requested at least 12 hours in advance of the playoff game in order for any chance of emergency goalie permission to be possibly granted. Emergency goalie permission will not be granted under any circumstances at/during/near the start of the playoff game. If a team brings an ineligible goalie to a playoff game (who hasn't been given permission in advance to be an emergency goalie for that playoff game) with less than the minimum 3 games played then the ineligible goalie automatically will not be given emergency goalie permission under any circumstances to play in that playoff game. The team will either have to dress one of their eligible skaters in that ineligible goalie's equipment to play goalie or forfeit and lose that playoff game. Again, the ineligible goalie will not be given emergency goalie permission to play in that playoff game under any circumstances. Reasons such as, however not limited to: forgot the current playoff eligibility/goalie unavailability rules, didn't check the current playoff eligibility/goalie unavailability rules, forgot to ask for emergency goalie permission in advance, didn't have time to ask for emergency goalie permission in advance, will not be accepted. Any player whose penalty has not yet expired when regulation time has ended will not be eligible to participate in the shootout and must remain in the penalty box. Any player who was removed from the game for a penalty or was ejected will not be eligible to participate in the shootout. If the score remains tied after regulation time, a best of three (3) vs. three (3) shootout will commence. The home team will have the choice to shoot first or second. If the score is still tied after the three (3) vs. three (3) shootout, there will be a sudden death shootout, with each team having an equal number of turns, to determine the winner. The goalie must remain in his or her crease until the skater taking the shot has touched the puck. If the goalie does not and if the shot fails the official(s) will have the same skater re-take the shot. The puck must be kept in motion towards the opponent's end of the ice. No goal can be scored on a rebound (unless the puck bounces off the goal post, then off the goalie, and then into the net). No skater may shoot more than once unless every other skater on their team has already shot. All regular season and playoff games have ice times of 1.25 hours (75 minutes) in length except for potential elimination CAHL Cup Championship games which have ice times of 1.5 hours (90 minutes) in length in order to accommodate the possibly needed post-game on-ice awards ceremony. All regular season and playoff games consist of three stop time periods: A 15 minute first period, a 15 minute second period, a 12 minute third period, and if tied a best of three shootout and then if still tied a sudden death shootout.